Figure 1: Schematic of the five main working groups in the second ozone initiative. The sixth working group looking at the different approaches to combining data sets is led by G. Bodeker and N. Harris. The remit in these six work packages will be re-assessed at the second workshop (from Harris et al., 2011). Figure 2: Combined ozone profile trends for the periods before 1998 (top row) and after 1998 (bottom row). Click image to enlarge and read the full legend. A common activity supported by SPARC, the IOC (International Ozone Commission), IGACO-O3/UV (Integrated Global Atmospheric Composition Observations), and NDACC (Network for Detection of Atmospheric Composition Change). The first letters of all partners combined make the activity’s acronym: SI2N. Goals and scientific background: The vertical distribution of stratospheric ozone on a global scale is determined by stratospheric chemistry and transport. The basic features of global vertical distribution of ozone available in the 1970s (see Dütsch, 1979 and Staehelin et al. 2001) were established based on ozone sondes and Umkehr measurements. Since 1972 ozone profiles have been monitored globally and quasi-continuously by satellite instruments, the longest datasets currently existing are the SAGE I and II and SBUV (/2) records. Beginning around 1970, the emission of anthropogenic ozone depleting substances started to affect the ozone layer. Concentrations of these species (as described by Equivalent Effective Stratospheric Chlorine) peaked in the second part of the 1990s. Stratospheric ozone profile changes, which vary in latitude and season, contain important information about anthropogenic chemical ozone depletion. During the 1990s information from SAGE I and II, SBUV, and other ground-based measurements revealed partially conflicting results, leading to a SPARC-led investigation and the first SPARC Assessment Report (SPARC Report No. 1, 1998). One key result of this report concerned Northern mid-latitudes: the ozone decrease in the lower stratosphere most strongly contributed to the significant downward trends in total ozone, with an additional maximum in ozone depletion occurring in the upper stratosphere showing a similar relative decrease in ozone mixing ratios (directly attributable to in situ ozone depletion by chlorofluorocarbons and other ozone depleting substances). Since the beginning of the 21st century, chemical ozone depletion should have slowly been decreasing and information on ozone profile changes is important to document the positive effect of the Montreal Protocol (see WMO, 2014). However, it is also known that stratospheric ozone may also be affected by climate change, e.g. the enhancement of the Brewer Dobson Circulation predicted by state-of-the-art numerical models (see e.g. Harris et al., 2008; Douglas et al., 2011). Reliable information on long-term changes of global ozone profiles from a single instrument does not exist, for example, because the SAGE-II record stopped in 2005 (Douglas et al., 2011). There are, however, several other instrumental records that have been used to obtain observations of vertical ozone changes in the recent past. These have been combined with older records in an attempt to produce homogeneous long-term ozone profile data sets. However, combining such records is challenging because one needs to take into account the small shifts between satellite time series which inevitably occur. At the same time, high quality ground-based ozone profile records, including measurements from NDACC, are becoming longer and include more stations around the globe. These ground-based data provide an excellent complimentary record for long-term profile trend analysis. Milestones and achievements: The initiative started with a workshop organized in Geneva in January 2011 at which it was decided to promote a new bottom-up activity to coordinate various on-going projects (e.g. supported by national space agencies and ESA (the European Space Agency)) and to stimulate additional efforts. The individual activities began by proving the quality, homogeneity, and consistence of different types of instrumental records (see Figure 1). In 2012 several meetings were held to discuss and coordinate the activities of the various groups contributing to SI2N. A plenary meeting (with 48 scientists) took place from 16-18 April 2012 near Baltimore, USA, and all groups contributing to the activity participated. This workshop included discussion about the quality of the ozone data sets and the time plan of the activity. It was also decided to publish the SI2N results in a special issue and to summarize the key results in three overview papers (see below). Other meetings were organized for individual groups, such as the ozone-sonde community and the NDACC community. In 2013 a SI2N meeting took place in Helsinki, Finland, from 18-20 September (attended by around 40 participants) in which the drafts of the three overview papers that summarize the main SI2N results were intensively discussed. Other papers published in the SI2N special issue and other relevant work was presented in the form of posters to ensure that the main results of the individual contributions were adequately by the three overview papers. By the end of 2015 the SI2N SPARC activity was formally terminated as decided in the SPARC SSG meeting in Boulder (CO, USA, November 10-13, 2015). Final results: The relevant results of SI2N are shown in a special issue jointly organized between Atmospheric Chemistry and Physics (ACP), Atmospheric Measurement Techniques (AMT), and Earth System Science Data ESSD): Changes in the vertical distribution of ozone – the SI2N report (see SI2N report by Bhartia et al., 2012). The special issue includes more than 50 published papers. The papers cover a wide variety of studies and deal with important aspects such as data quality and trend analyses of ground-based ozone profile measurements (in relation to NDACC and GAW) and different satellite data sets. 7 merged long-term satellite series (with different lengths) were produced and used as a basis for a quasi-global ozone profile trend analysis (see Tummon et al, ACP, 2015). Three overview papers that summarize the main results of SI2N are being published. One of these papers, describing all relevant measurement systems, was published in by Hassler et al. AMT, 2014. A second paper presenting an analysis of the trends with a particular emphasis on estimating the trend uncertainties was published by Harris et al., ACP, 2015. The third which will summarise the data quality of the ozone records is being prepared. Its production has been overtaken by a paper describing a thorough comparison of the satellite measurements using the ground-based measurements (Hubert et al., AMT, currently under AMT). Part of the most relevant findings of SI2N are shown in Figure 2 (Harris et al., ACP, 2015). The work in SI2N has clearly shown the need for on-going, high quality measurements of the vertical distribution of ozone. The absolute importance of stability in being able to produce meaningful ozone trends and credible uncertainties is clear and will require continued observation. Satellite measurements giving a quasi-global view must be complemented by well calibrated ground-based measurements and the production of merged satellite ozone profile data needs further attention. Furthermore, the unquestionable demonstration of positive ozone profile trends as expected from the Montreal Protocol requires longer time series. Important unresolved aspects of SI2N will be incorporated into the work on long-term records developed under the new SPARC Implementation Plan. Bhartia, P. K., N. Harris, M. van Roozendael, M. Weber, R. Eckman, D. Loyola, J. Urban, C. von Savigny, M. Dameris, S. Godin-Beekmann (eds. ), 2012: Changes in the vertical distribution of ozone – the SI2N report. Atmospheric Chemistry and Physics, special issue 284. Douglass, A., V. E. Fioletov et al., 2010: Stratospheric Ozone and Surface Ultraviolet Radiation, Chapter 2 in Scientific Assessment of Ozone Depletion: 2010, Global Ozone Research and Monitoring Project–Report No. 52, 516 pp., World Meteorological Organization, Geneva, Switzerland, 2010. Dütsch, H.-U., 1979: The vertical ozone distribution on a global scale. Pure Appl. Geophys., 116, 511-529. 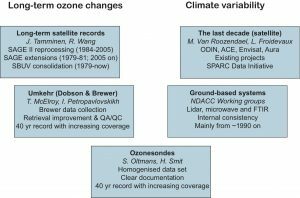 Harris, N.R.P., J. Staehelin, and R. Stolarski (2011) The New Initiative on Past Changes in the Vertical Distribution of Ozone, SPARC Newsletters No. 37, July 2011. Harris, N.R.P., and J. Staehelin (2011) SPARC/IGACO-O3/IOC Initiative on Understanding Past Changes in Vertical Distribution of Ozone. See workshop presentation. SPARC Report No. 1 (1998) SPARC/IOC/GAW Assessment of Trends in the Vertical Distribution of Ozone. By N. Harris, R. Hudson and C. Phillips (eds.). WMO Ozone Research and Monitoring Project Report No. 43. Staehelin, J., N.R.P. Harris, C. Appenzeller, and J. Eberhard (2001) Ozone trends: A review. Rev. Geophys., 39, 231-290. WMO, Scientific Assessment of Ozone Depletion (2010) Global Ozone Research and Monitoring Project–Report No. 52, 516 pp., World Meteorological Organization, Geneva, Switzerland, 2010. Bhartia, P. K., N. Harris, M. van Roozendael, M. Weber, R. Eckman, D. Loyola, J. Urban, C. von Savigny, M. Dameris, S. Godin-Beekmann (eds. ), 2012: Changes in the vertical distribution of ozone – the SI2N report. Atmospheric Chemistry and Physics, Special issue. SPARC Newsletter No. 47, 2016, p. 4: The SI2N Initiative: An Overview of Ozone Profile Trends, by Harris, N.R.P., B. Hassler, D. Hubert, F. Tummon, and J. Staehelin. SPARC Newsletter No. 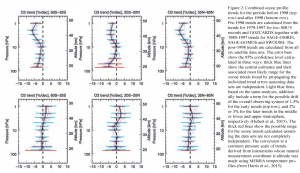 39, 2012, p. 21: Progress Report on the SI2N Initiative on Past Changes in the Vertical Distribution of Ozone by Harris, N.R.P., J. Staehelin, and R. Stolarski. SPARC Newsletter No. 37, 2011, p. 23: The New Initiative on Past Changes in the Vertical Distribution of Ozone, by Harris, N.R.P., J. Staehelin, and R. Stolarski. Please remember to send us a quick email with your feedback to gro.e1555899751tamil1555899751c-cra1555899751ps@ec1555899751iffo 1555899751. Thanks!